On a glorious sunny evening in London, Investec welcomed Aon Hewitt back to Shepherds Bush Cricket Club, with the visitors holding their tails high following a narrow victory last season. Aon captain Priyesh Patel elected to bowl after winning the all-important toss which saw Abhishek Madhavan and Patel himself steaming in for the away side. Mike Procter and Varun “Brian Lara” Laijawalla opened Investec’s batting and it was Procter’s big hitting approach that proved more effective as he raced to 19 off 8 balls. The breakthrough soon came as both opening batsman were dismissed by Patel and Madhavan within the opening 3 overs. On came the battle of the more experienced heads with Frank Doyle and Ed Evers facing off against the star bowling show of Colin Cartwright, who dismissed the pair during his spell, with a very respectable economy of 4.17. Bogged down, Investec looked to Jeff Boswell and Blake Musgrove to steady the ship. The pair did exactly that, firing on all cylinders with a number of boundaries and great running between the wickets. This period saw Boswell move to 21 before being expertly caught by captain Patel off a cover drive destined for the boundary. 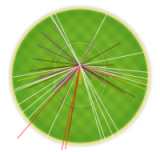 Musgrove also took no prisoners retiring with 25 off 14 balls -the runs coming from a variety of lovely shots. Investec’s middle to tail order proved strong with fast scoring continuing through Small, Macdonald and Morgan, scoring 19, 14 and 12 respectively but it was the pacey bowling performance of Greg Keddy who’s confidence grew throughout his spell that dismissed the majority of the Investec tail. Notable performances with the ball for Aon Hewitt were Abhishek Madhavan with 25-1 and Colin Cartwright with 16-2 off their 4 overs. A total of 150-8 from their 20 overs saw the home side feeling confident going into the interval. Aon’s opening pairing of Jonathan Ford and Mandeep Jagpal got off to a strong start for the chasing team hitting 14 and 22 respectively. Ryan Millard was in and out swiftly for 5 runs before the impressive Priyesh Patel and Matt Sinnett came to the crease. Both men made use of the lightning outfield as they raced to retirement with 7 boundaries and 56 runs between them. These retirements came all too soon for Aon as the next few batsman struggled to keep the firing run rate up and were slowly picked off by the neat bowling of Blake Musgrove and Stephen Small. It was up to Colin Cartwright and the returning retiree’s to continue the chase, however after two “disputed appeals”, Cartwright was dismissed after being unfortunately run out by his own teammate. This left Aon needing 17 off of the last over which was one step too far as they finished up on 139-8. Some strong Investec bowling performances came from Stephen Small, Grant Macdonald, Jeff Boswell and Mike Procter. Another excellent cricket game down at the Bush with a fine evening to accompany it. We would like to thank our guests Aon Hewitt and look forward to next year’s game.